For happy hour on Wednesday, April 22, you can choose to do something that involves drinking good beer and raising money for a good cause. Brew Review, a Northwest craft brewfest and silent auction, will be pouring beers from eight Seattle breweries and one local cider producer. The event will be held at Axis in Pioneer Square from 5pm to 8pm. 100% of the $30 ticket price will go to benefit the Unemployment Law Project, which is a non-profit law office that helps people who lost their jobs obtain unemployment benefits in times of need. Tickets include 7 four-ounce pours & appetizers. There will also be a silent auction where you can bid on items like a Seahawks helmet signed by Richard Sherman or an Xbox One. Seattle, WA, March 31, 2015. 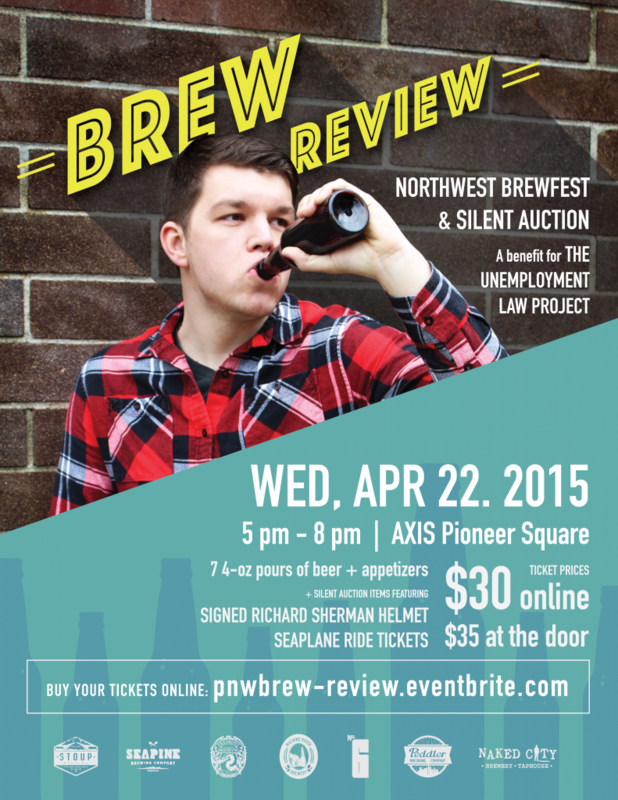 For happy hour, join the Unemployment Law Project partners, 8 local breweries, and one local cider house for Brew Review, a Northwest craft brewfest and silent auction! Fremont Brewing, Hale’s Ales, Peddler Brewing, Stoup Brewing, Seapine Brewing, Machine House, Pike Brewing, and Cider No. 6 will all be present at the event. Naked City Brewing is also donating beer to the event for one extra flavor. Each $30 ticket comes with 7 four-ounce pours. Each brewery is bringing two different brews types to the event. Appetizers are also included and the event is being hosted in a beautiful historic brick building in Pioneer Square. Additional tastes will be sold at the event so guests do not have to miss any flavors $2 for one or $5 for three. The silent auction will also have fantastic items to bid on including a signed Richard Sherman Helmet! Other exciting items include: seaplane ride tickets, an Xbox One, a weekend vacation in Methow Valley, tickets to the Cinerama, and a $200 gift certificate for Trunk Club for Men! Bidding will begin online and finish up during the event. 100% of the fund raised will go to the Unemployment Law Project. The Unemployment Law Project is a non-profit law office that helps people who lost their jobs obtain unemployment benefits while they search for a new position. This non-profit makes a little bit go a long way; with a staff of 4 or less the Unemployment Law Project served over 566 clients state-wide. The funds raised at this event will go toward creating a fellowship to add a new employee to the Unemployment Law Project’s staff and increase their capacity to help more people. Did you miss the part about this being a fundraiser? You know, helping a worthy organization by donating money and getting a few beers and fun in return? You can bust back some dank angry beers, brah! The event was great. The pours were generous. Well worth $30. Food was included.